Last week, Cotton Incorporated SVP of global marketing supply chain, Mark Messura, presented a cotton market analysis at the Union League Club, sponsored by the American Apparel and Footwear Association's Intimate Apparel Council. 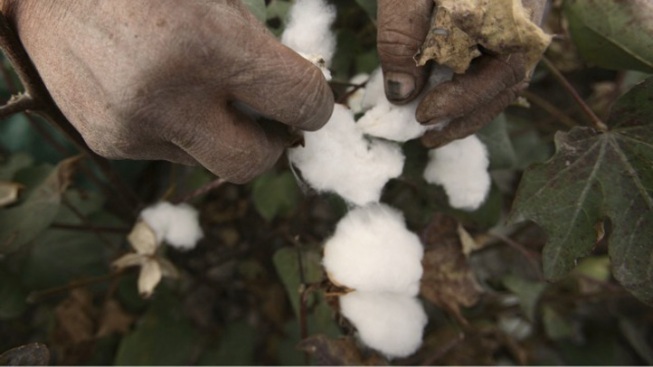 According to WWD's report on Messura's analysis, there has been a sharp decline of worldwide cotton production due to China's shifted focus on corn and soy crops, and, here in the US, the rash of natural disasters in Texas, our primary cotton producer. As a result, Messura predicts prices to close within the $1.50-$1.80-per-pound range for the next few months -- this after hitting a "record peak" of $2.44 on March 8, WWD reports. What this means for the consumer remains to be seen, as retailers -- especially cotton-reliant companies like denim brands -- deal with the inflation. While a few dollars added on to price tags here and there may be an inevitable repercussion on the store floor, price hikes on clothing remain a last resort, and for now, it's the retailers that are absorbing the increases, reports WWD. In addition, when Thread NY reported on the quickening climb of cotton prices back in October, their sources on the farm side did some number-crunching to show why, despite the rising cotton prices, retailers still shouldn't get away with any significant price hikes. Again, we'll have to wait and see what happens to prices on clothing, though as a bit of a sneak preview, it sounds like we'll be seeing a lot of dark denim dominationg the shelves: As Vintage Revolution president Michael Press told WWD: "For the past two years, so much of our market has been dark denim, and a lot of the reason is that is the cheapest wash to produce."